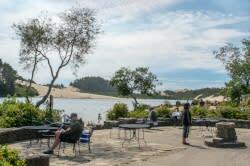 Living in the Willamette Valley, one of my favorite places to head in the summer to cool off is the Oregon Coast. The sand under my toes and a cool breeze at night sure beats my un-air conditioned house. 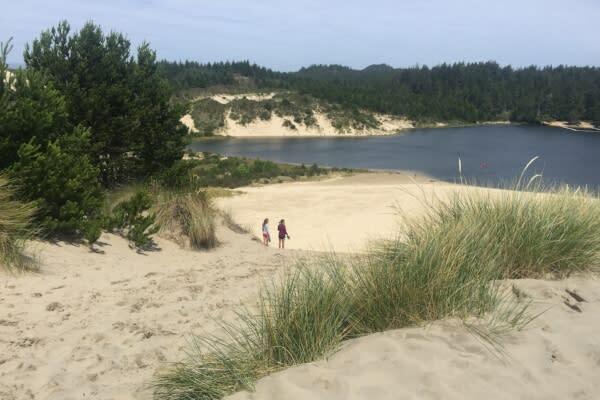 The Oregon Dunes National Recreation Area, which is managed by the Siuslaw National Forest, has a range of activities for locals and visitors who want to get out and enjoy the sand. Probably best known for its world-class OHV (off-highway vehicle) riding opportunities, the dunes also offer many options for hiking, paddling, bird watching and, my favorite, camping. There are a variety of different camping options around the dunes recreation area. If you’re towing your OHV and plan to get out on the sand, you may want to check out one of the several campgrounds like Driftwood II or Spinreel, which have easy access to the sand (and Driftwood even has hot showers to rinse all that sand and sunscreen off). More adventurous types with the right kind of rig can reserve a campsite right on the sand – car camping amongst the dunes, doesn’t get better than that. If you’re planning to explore the dunes on foot, you may want to opt for one of the traditional family campgrounds, like Eel Creek or Tahkenitch to name a few, which have lovely campsites nestled among the shore pine and wax myrtle. No matter what activity you choose, if you’re headed to the dunes, there’s one thing everybody needs to do this summer – share the beach. Between March 15 and September 15, a small shorebird called the western snowy plover is out on the dunes nesting and raising their young. 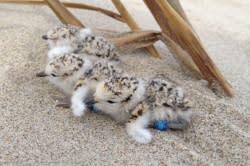 These cute little birds that skitter across the sand and have chicks that look like little fluffy cotton balls, they’re threatened and need help from all of us to survive. Some parts of the dunes are important nesting areas for the plover; in those well-marked areas, certain activities that could frighten or harm the birds aren’t allowed and the dry sand is off limits (walking on the wet sand is still okay, but please leave your pup at home). Other parts of the dunes are plover-free, and so those are the best places to go to ride your bike or buggie, fly a kite, play fetch with Fido or toss a disc. Fortunately, the dunes are big enough that there’s room for all of us. And I quite like knowing that this place that feels so special to me, is also special to these unassuming birds that rely on the sand for their survival. Sometimes, when the valley feels like a hot oven on an August afternoon, I think I need the dunes for my own survival too. Enjoy! 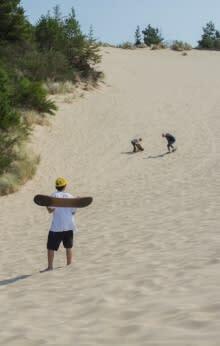 The U.S. Forest Service provides dunes information on riding, hiking, camping on the dunes and more. 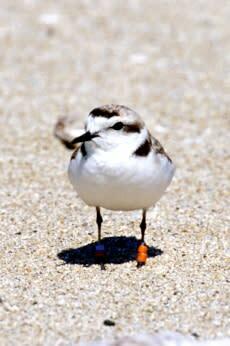 Watch for plover signage and know which dunes and beaches have plover-related restrictions before you go. Summer 2017 dunes recreation closures: As of this writing, some dunes campgrounds and day use sites are closed due to flooding. For the most up to date information on what’s open and closed check out forest alerts or call or visit any forest office.